Both the BJP and the Congress, the two largest national parties in India, have presented manifestos that are close to their ideological positions. In doing so, they have established the political framework for the 2019 Lok Sabha elections. While the Congress party has focused on the economic concerns of ordinary Indians and minority rights, the BJP’s focus is more on national security, cultural ethos and big infrastructural projects. So, which ideological position are voters likely to favour in this election? Nearly all pre-poll surveys released in the last few weeks indicate that voters prioritise economic concerns over other subjects when asked about the most important issue for them while voting. 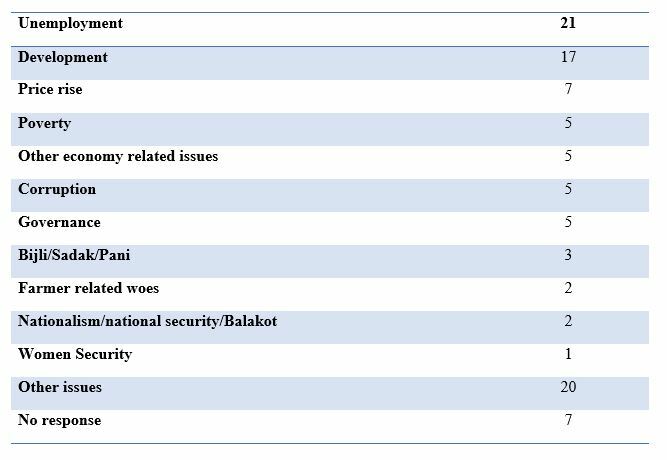 For example, in an open-ended question to identify the most significant electoral issue, the respondents in the Lokniti-CSDS pre-poll survey overwhelmingly pointed to economic issues such as unemployment, development and price rise over national security concerns (See Table 1). Source: Lokniti-CSDS pre-poll survey, 2019. These economic issues have received greater weight in the Congress party’s manifestos, yet respondents in the pre-poll surveys are more likely to vote for the BJP than the Congress. Most pollsters are betting on the return of BJP-led NDA to power. The emerging consensus is that Balakot has heightened nationalistic sentiments among Indian voters and has given a significant bump in Prime Minister Modi’s popularity. The BJP is reaping the dividends of these two factors. What explains this puzzling behaviour of Indian voters? And why is the BJP using national security as its main campaign plank? Political scientists distinguish between two types of issues – valence issues and positional issues. On valence issues, a vast majority of voters have similar views. In other words, all citizens would like development, reduction of poverty, fight against corruption and an improvement in the conditions of rural (and even urban) India. Voters tend to have common goals on such issues and parties compete on effectively fulfilling them. Satisfactory handling of valence issues gives incumbents an advantage, while mismanagement gives challengers a short-term opportunity to mobilise voters on these issues. Corruption became a mobilisational plank for the BJP in 2014. On positional issues, political parties usually have divergent views and they try to convince voters about their respective positions. Positional issues include core ideological subjects, such as the BJP’s stand to do away with Article 370 of the Indian Constitution that accords special status to the state of Jammu and Kashmir or the Congress’ position on secularism. It is important to note that national security in itself is a valence issue, but how a party chooses to approach it is a positional issue. The BJP’s ideological position, for instance, drives its stance on hard nationalism. Indian voters, like their counterparts across the globe, tend to prioritise valence issues when asked about the most important issue while voting. The evidence from previous National Election Study (NES) surveys bears testimony to this fact. In the 2009 and 2014 NES, a plurality of voters mentioned valence issues such as corruption, price rise, employment, and bijli-sadak-paani (electricity, roads, and water) as their most important concerns. However, as our fieldwork in rural Uttar Pradesh suggests, these encompassing categories may be capturing a very diverse worldview. For instance, a farmer and a middle-class person have fairly different grievances when they complain about price rise. The combination of these two pieces of evidence offers a very crucial insight about Indian politics: Indian voters are unable to articulate their sectional priorities and respond in very generic terms. The effects of this have been far-reaching in terms of electoral mobilisation and prioritising issues in campaign speeches. Sectional mobilisation of class and occupational groups during elections is rare (e.g., farmers do not participate in the electoral process as an occupational group) and political campaigns in India tend to get framed around large encompassing categories of “vikaas” (development), “mehengai” (price rise), “naukari” (jobs) and “bhrastachar” (corruption). Nonetheless, elections in India and elsewhere, most often, have a subterranean context of a positional issue. 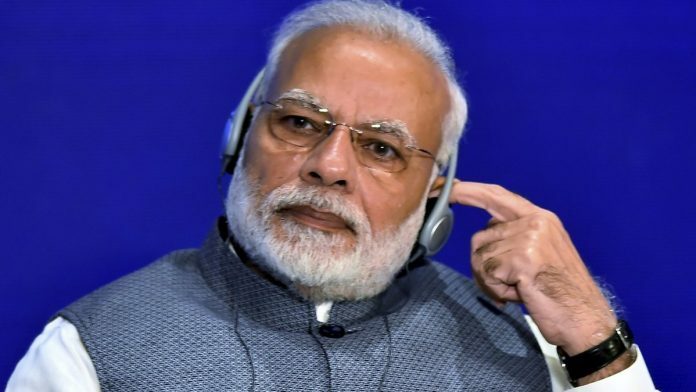 In the aftermath of Pulwama and Balakot, hard stance on the question of national security has become salient, and the BJP has gone all out to make this issue its main campaign plank. The BJP, like most Right-wing parties, has a natural advantage over the national security plank – the party owns the issue. How does the theory of issue ownership help in understanding the puzzling behaviour of Indian voters in the run-up to the 2019 Lok Sabha elections? Issue ownership suggests that voters associate a particular issue with a specific party, which is considered more competent to deal with it. Thus, political parties during the election campaign make an effort to shift the focus towards the issues that they ‘own.’ Ownership of an issue essentially depends on the party’s ideological position and its social support base. The choices made by the party in adopting a particular position on an issue is critical for building its “reputation” on the handling of that issue. The path dependency of these choices either enhances or restricts the party’s ability to own an issue. The Congress party in post-Indira Gandhi years gave away its position to the BJP on the national security question. The pre-poll surveys conducted by Lokniti-CSDS and other agencies point to the unambiguous presence of heightened national security concerns while determining voters’ responses on most indicators. In less than a year, there seems to be a turnaround for the BJP. The preference for Narendra Modi as India’s next prime minister has increased by nine percentage points, and now more respondents are inclined to vote for the BJP, finds the Lokniti-CSDS pre-poll survey. 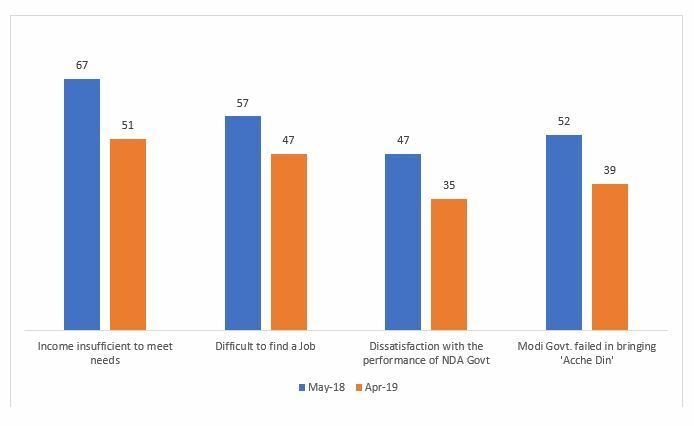 Post-Balakot, national security has become the lens through which voters are viewing the performance of the NDA government and rating it more favourably than in the past, even on economy-related issues (See Figure 1). The number of respondents who believe that the current economic situation of the country is good has also gone up. Most surveys were conducted in mid-March, at a time when nationalist sentiments would have been at their highest, and that’s why it’s no surprise that pollsters are estimating a decisive lead for the BJP-led NDA. We will find out on 23 May if national security concerns subsided as the election progressed or provided momentum to Modi’s campaign. Rahul Verma is Fellow at the Centre for Policy Research, Delhi. Pranav Gupta is a PhD student in political science at the University of California at Berkeley, US.